Yeah sorry have my BH TD team with Boba lead is modded for potency so they have 50-70% base. So was adding that to Cads leader. Sorry. Hmmm.. sounds like palp. 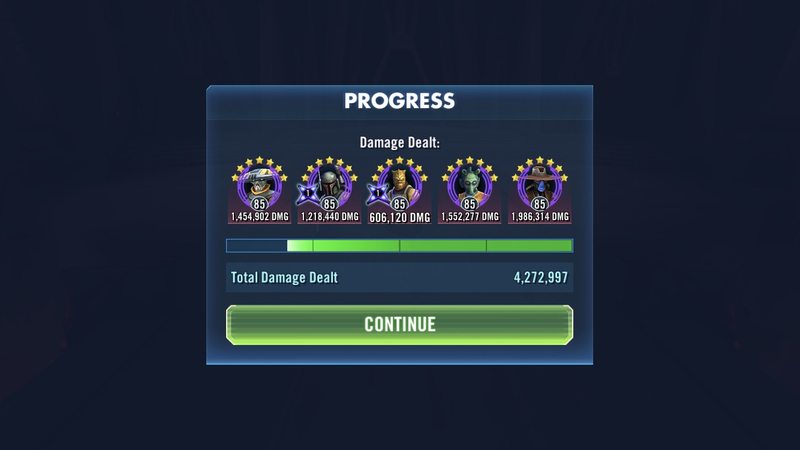 I wonder how many shots Greedo will get off with that potency buff? He gives 100% potency, and Bastila gives 150% tenacity, so he would be in the hole by 50%. The other -50% tenacity only comes with the payout after sticking 20 debuffs. That will be difficult with the extra tenacity to overcome. Also Yoda throws out foresight, and tenacity up (9999% tenacity I believe) quite frequently. Also the Jedi team is faster naturally, has a free TM boost to start the match, and gets a big offense boost. All mods being equal, the Jedi will go first WAAAAAAAY before any of the Bounty Hunters. Especially Cad Bane (aka Lead Shoes McGee). The Yodas+Ezra would likely kill someone, and Old Ben will ability block/TM reduce/offense down the whole team. Then some Jedi would start 2nd turns before the Bounty Hunters even get a first move. In other words, Cad Bane is trash in arena. Might be OK to fill out other BH leader teams in other game modes. I can see him in a good mop up team in TW. Or just part of bounty hunter B team on offense. I think he just needs a zeta on his unique. There's so much that they could add to when he scores critical hits. I hope they add one before the release the update. Boo! Cad is the best bounty hunter in the clone wars era and is one of the best villains from the clone wars tv series! You think they’d at least give him a new special ability or update his unique a bit to make him faster like Vader. Even his leader ability is useless, and cad lead several bounty hunter teams with great success, breaking ziro the hutt our of prison by ransoming the senate, and capturing chancellor palpatine, a plan that only failed because of some trickery by dooku and obi was being on the inside (it would have failed regardless, because palps could have killed him in a second but the point still stands). Yet, we still can’t see this guy succeed in the game. They made greedo at least have a decent niche in phase 3, and the same goes with aurra. Cad basically went from being just plain trash to being kind of ok for a beginner player (also they changed his appearance which is kinda cool I guess). I hope CG can realize they made a mistake and work on him again in the future, but I highly doubt that would happen. The only other thing that could make up for this is a grievous rework (hint hint) or jango fett. In all fairness, even with all the complaints, the accuracy down debuff is super rad. Put it on Palp, vadar, or scion... its funny. They miss everyone with thier AOE. 1. Higher base speed, ir more turn meter gain. Maybe start the match like raid han with a shoot first thingy. 2. Make his leader ability apply to all scoundrels like it used too, and put the old leader abilities back in the mix with the new ones. Two simple fixes, will make him a beast. The accuracy down is still legit though. I'm really glad he got the pass - I don't have any complaints about what was done since he's a freebie toon anyways. But at his speed it's not really worth gearing him more even for a mop-up team. I wish cad bane had a second special and a zeta on his unique like this: Take an extra turn at the beginning of every encounter where he can only use his second special. New special: Place thermal detonators on all enemies that explode after 1 turn. If the enemy resists this thermal detonator remove 20% turn meter which cannot be resisted. This would help out the bounty hunters in the arena a whole lot, which I would love. Are they serious? We're taking about CAD BANE. The blue ex smoker from the anti cigarette commercials who took on two jedi masters at the same time, and came out a free alien. He freaking trained boba fett. Do the devs know who Cad Bane is? He's more powerful than any of the **** bounty hunters they have in the game. This is disappointing. #notmycadbane Lately, I've been upset with many of their choices. Someone from my guild quit GOH today. He can actually put out pretty good damage now. I tested him under Qira lead and because of his double attack he procs her Insult to Injury unique a bunch and helps het her prepared. Mabe not the best BH but hes a respectable damage dealer now. I think there may be some more to this rework than most have thought. With Qi'ra becoming farmable recently, i decided to see what works well under her lead ability. When i saw Cad Bane's rework, i initially thought it was average. not great not bad, just made him playable and he could survive longer. But after I looked at the synergy between Qi'ra and Cad Bane, it was surpising. Cad Bane gains a lot more survivability under Qi'ra! he'll crit all the time under her lead (his 30% from unique + 20% from Qi'ra lead + mods/base crit chance). He lands debuffs now and that gives him more survival ability with his unique. Qi'ra turns this rather slow bounty hunter into a pretty fast one for this one simple reason.....he's a support character. Unlike a majority of other bounty hunters who are attackers, Cad Bane is unique in that he is a support. So under Qi'ra lead, every time he crits he's gaining +20 speed which will stack up to +60 speed, giving him a speed of 185 before mods. Pretty fast! The synergy between Qi'ras Joint Operation SA and Cad Bane is really good to, making the good effects in that attack benefit both Qi'ra and Cad. There is something to this rework, it just isn't obvious. I'm sure there are some other cool combos and syenrgies out there, so it'll be fun to see what people come up with. This is just one of the ideas i discovered so i thought i'd share it with you all. Agree. He procs her prepared a lot too. Ive been testing Qira Vandor Zalbar Young Han and Cad for the last week. A light side scoundrel would be better, but he works pretty well and does a lot of damage. Qira lead for him is ok, but no contract. I actually used him as lead with zam, jawa engineer, jawa scav, and nebit for a pretty amusing bomb line in Tw. in the low tier str i use bossk lead, cad, zam, jawa engineer, and jawa scavenger. same result, bombs for days. Tier IV, p2. 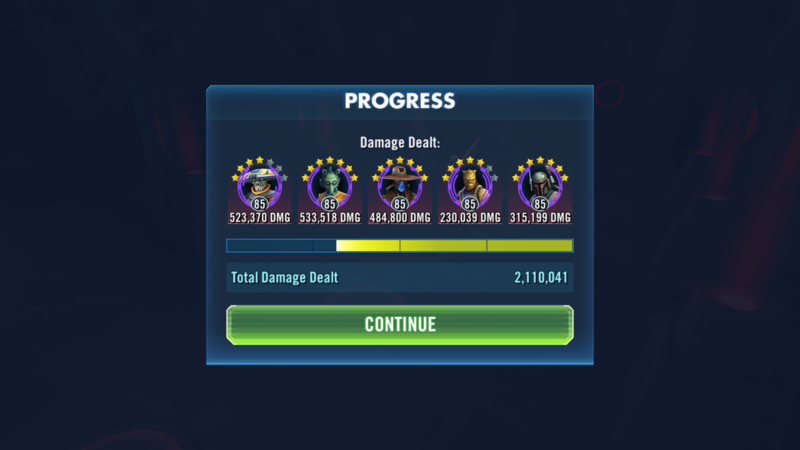 No full contract or zeta or crit damage mods. Looking pretty good actually. Wont let me post the screen for some reason but he did as much damage as Greedo and Embo. Nice. Looks like he is intended as a raid Damage dealer. Fine by me. Positive rework.